FAYETTEVILLE (KFSM)–For the first time in school history, Arkansas faces a pair of in-state opponents on the baseball diamond. Both the University of Arkansas at Little Rock (April 2) and the University of Arkansas at Pine Bluff (April 16) will travel to Fayetteville to take on the Diamond Hogs. 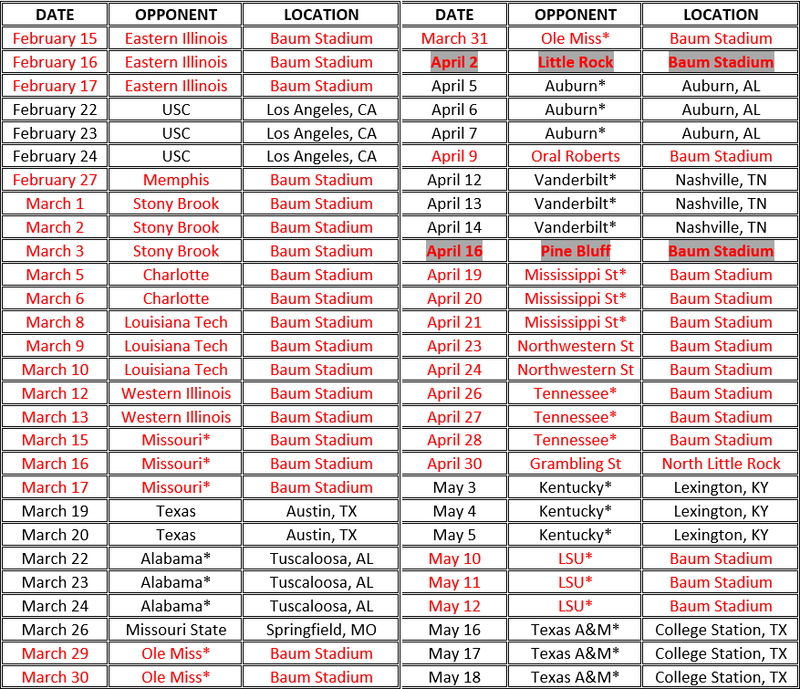 In Dave Van Horn’s 17th season, Arkansas plays 35 home games including SEC series against Missouri, Ole Miss, Mississippi State and LSU. The Hogs also host Tennessee, coached by former Razorback assistant Tony Vitello. The 2019 slate is highlighted by 9 NCAA tournament teams including two other College World Series teams (Texas & Mississippi State). The two biggest roadtrips are a three game series at Southern California and two midweek games at Texas. Other SEC series include weekends against Alabama, Auburn, Vanderbilt, Kentucky and Texas A&M on the road. Arkansas is coming off its second appearance in the College World Series finals, where the Razorbacks lost 2-1 to Oregon State. The Diamond Hogs went 48-21 in 2018. The season opener is set for February 15 against Eastern Illinois, and the full schedule can be found below.